The Mother was born Mirra Alfassa in Paris on 21 February 1878. In 1914 the Mother travelled to Pondicherry to meet Sri Aurobindo, whom she at once recognised as the one who had inwardly guided her for many years. After 11 months she was obliged to return to France and in April 1920 she rejoined Sri Aurobindo. When the Sri Aurobindo Ashram was formed in November 1926, Sri Aurobindo entrusted its full material and spiritual charge to her. Sri Sri Ma meets the Mother of Pondicherry (on 3rd of November, 1952) On November 3, she was at Pondicherry. 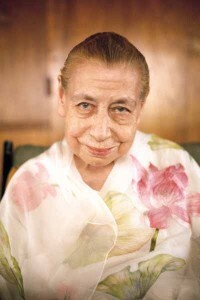 At eleven in the morning that day she had a meeting with “The Mother”, who stood in the sitting room of Sri Aurobindo. Mother looked at her for a long time with a fixed gaze as Ma looked at her with a natural poise. Mother’s eyes blinked after a long time. She presented Ma with a rose, a ‘ball’ flower (globe lily) and two pieces of chocolate. Ma returned the rose and one piece of chocolate. Mother kept the chocolate but gave the rose back. This exchange of flowers was repeated twice or thrice after which Mother tore a portion off the rose and returned the rest to Ma. The same evening the two had another meeting at the same place. Mother was distributing roasted peanuts to visitors with a spoon from a wooden container. She offered some to Ma who said, “This little girl is the youngest of all.” Mother said in English “Forever a little child.” The singer-saint Dilip Roy, an inmate of Pondicherry, met Ma several times during her stay and sang before her. From”Anandamayee – The Universal Mother”. Sri Ma has given her own account of this meeting (Ananda Varta, P. 171 Vol VII,No 4 1960). As you know, Sri Haribabaji took this small child with him when he went on a pilgrimage to South India. This is precisely how this little child went to see the Mother of the Sri Aurobindo Ashram. This body did not approach the Mother in quest of spiritual experience or the like; a little girl is simple and natural in the presence of her own mother. You well know that the behaviour of this body is quite Unpredictable (‘elomelo’): here there is no question of giving or receiving power, of finding anything bearable or unbearable-whatever comes to pass at any time is as it should be. As this body feels here with you now, just exactly the same it felt at Pondicherry. What is the difference between this body, the Mother and you all ? Erom your angle of vision only they are different one from the other. “Very well then, since you are eager to hear, listen – When the Mother came and stood before this body, this body out of its own kheyal looked straight into the Mother’s eyes and for a moment, just as it looks at all of you ; but then the kheyal came that the sadhus who had come with us were all being kept standing and so this body for a second looked in their direction ; then again there was the kheyal to respond fully to the blinkless gaze of the Mother. Turning to us Mataji added : “You all witnessed this yourselves. The Mother’s eyes did not even radiate intense light while focussed on this small girl. Mataji laughed and then continued : “If someone had told this body that at the Pondicherry Ashram it was a rule to respond from the very beginning to the Mother’s gaze and look straight into her eyes, this body would have had the kheyal to do accordingly. Every place and every condition, wherever and whatever they may be, are but the ONE. If the kheyal had come, this body would spontaneously have acted (to whatever extent it might be) as consistent with the demands of that particular place. Where this body was made to stay, there it stayed. When and where it was taken to see (someone or something ) it did go and see at the appointed time and place. Further it sat down or stood up, etc. for precisely the length of time and at any particular spot that was in keeping with the ritual of the place, so far as it had been made known to this body. From your worldly point of view there are no doubt a great many different ways of expressing things. So long as the individual is what it is and has not been freed from its knots, how can a correct solution of any problem be arrived at ? Ethyl Merston records the meeting: Everyone sat with Khukhi (Sri Ma) for some time, expecting a meeting with The Mother. Nothing happened. They went to sit by the flower covered samadhi of Sri Aurobindo in the ashram itself. Finally a summons came from The Mother for Khukhi. She was to go upstairs for darshan. She went up with her two close attendants, Didi and Bhumi, and two sadhus. Ethel and the other four decided to see the meeting of the two “saintly women”. They went up a narrow steep stairway to a landing where a doorway opened into a room. They sat down. Just inside the open door, close to Ethel, stood The Mother with her attendants. Mataji emerged through a doorway at the far end of the room. Ethel looked at her watch to fix the time of the meeting: 11.25 am. Anandamayi Ma came down the two steps into the room followed by her people in single file: she smiled as she approached The Mother, who stood rigid, unsmiling and motionless, her hands clenched behind her back, her head thrust forward fixing Khukhi with her eyes. It was an amazing meeting, completely silent. For a moment Khukhi looked taken aback by the fixed unwelcoming stare, then just stood still facing The Mother and relaxed, simple and childlike. There they both stood, not a muscle of their bodies moved, it was like puppets arrested suddenly, frozen; each showed her essence: power and simplicity. It lasted 15 minutes by our watches! Then The Mother relaxed, took some flowers and handed them to Khukhi who took and then returned them: again The Mother gave them and this time Khukhi took them and passed them back to her attendants; the sadhus too each got a flower. Khukhi then stepped forward, took The Mother’s hand, fondled it, The Mother returned the caress, whereupon Khukhi and the others passed her to leave the room. Not a word had been spoken. We eavesdroppers fled downstairs as Anandamayi Ma came to the door. Never would we forget that meeting, the tension, the atmosphere and that silence. The Mother now came over to Khukhi who told The Mother she was a very young child, and The Mother was her Ma. “They both laughed over this and Khukhi put her head on The Mother’s breast.” At five o’clock the next morning Mataji and her devotees left.